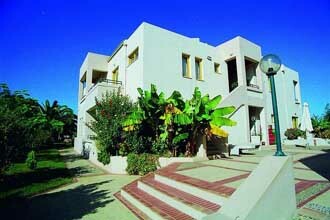 The pleasant and well maintained modern Lycasti apartments are quietly positioned down a leafy side road within easy walking distance to the sea. The complex has a most attractive large swimming pool with a bridge and children's shallow end, pool bar and sun terrace, garden furniture and sun beds, all set within lush established gardens with graceful large date palms offering shade on the surrounding lawns. Lycasti has an attractive reception area with bar, comfortable seating and TV. A handsome paved area with stone seating and sun umbrellas, leads across to a second building where the studios and maisonettes are positioned off large cool central corridors nicely decorated with potted plants. A: Eleven studios (26 sqm), suitable for 2-3 people, all on the ground floor, which are very large, each with private sun terrace, shower/wc, and mostly furnished with twin beds. There is a simple kitchenette unit, with two electric rings, and a small fridge. A safety deposit box and central heating are available if required (at an extra charge). B: Four one bedroomed apartments (35 sqm), suitable for 3-4 people, which are very large, and each has a private sun terrace/balcony. The apartments are furnished with twin beds, one sofa bed (camp bed for 4th person), shower/wc and a kitchenette. C: Three maisonettes (35 sqm), suitable for 3-4 people, with staircase to a sleeping gallery and a living/bedroom area beneath. The maisonettes are quite spacious, each with shower/wc, private balcony, small kitchenette, and double sofa bed. D: Four maisonettes (50 sqm), suitable for 4 people, with one bedroom with twin beds, and a sleeping gallery with a double bed. There is a shower/wc, small kitchenette and private balcony. The nearest taverna is approx. 500 metres away and the nearest mini market about 200 metres. The pebble beach is approx. 800 metres down the side road, with a small sand and shingle cove a little further around the tree lined shore. There are three tavernas along the seashore. Car hire is recommended.